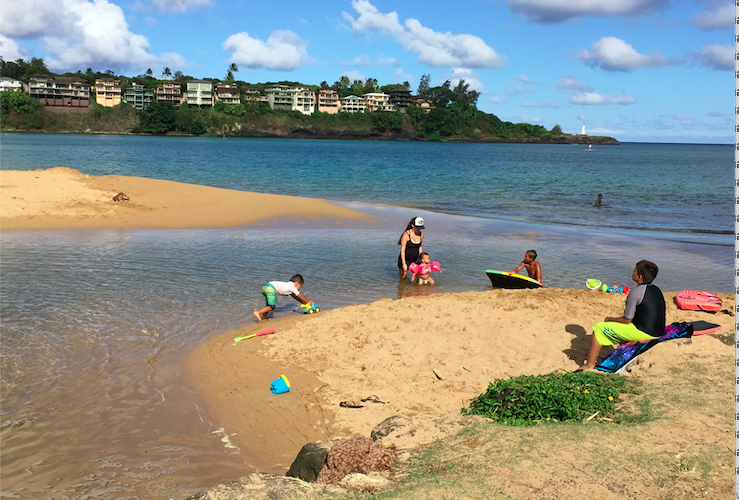 The water quality report just released by the Kauai Chapter’s Blue Water Task Force shows that surfbreaks and lifeguarded beaches are generally clean across the island, but several streams and rivers are chronically polluted where they discharge onto the beach and into the ocean. The Kauai Chapter established its BWTF program over a decade ago to supplement the water quality information provided by the Hawaii Department of Health’s (HDOH) beach monitoring program. The state collects water samples at popular ocean beaches, and Surfrider collects at surfbreaks and in estuaries where canal, stream, or river water meets the ocean at the beach. The latter sites are extremely popular places for children to play in the water. Most of the 42 beaches monitored by the state, nearly always test clean with bacteria levels far below the water quality criteria set to protect public health in recreational waters. Four beaches have shown some problems with high bacteria levels. HDOH has posted permanent signs at two of these beaches that failed to meet the health standard every time they were tested in 2018 - Niumalu Beach Park and Hanamaulu Beach. Visit the Clean Water Branch's website to view current advisories issued by HDOH. In contrast, Surfrider’s BWTF data shows ten sampling sites that exceeded the health standard every single time they were tested last year. Another eight sites measured high bacteria levels more than 80% of the time they were tested. Despite this, only a few of these chronically polluted sites have any physical signs at the beach warning people of the health risks. Many are preferred spots for families with children to get into the calm, shallow water where streams flow across the beach and into the ocean. 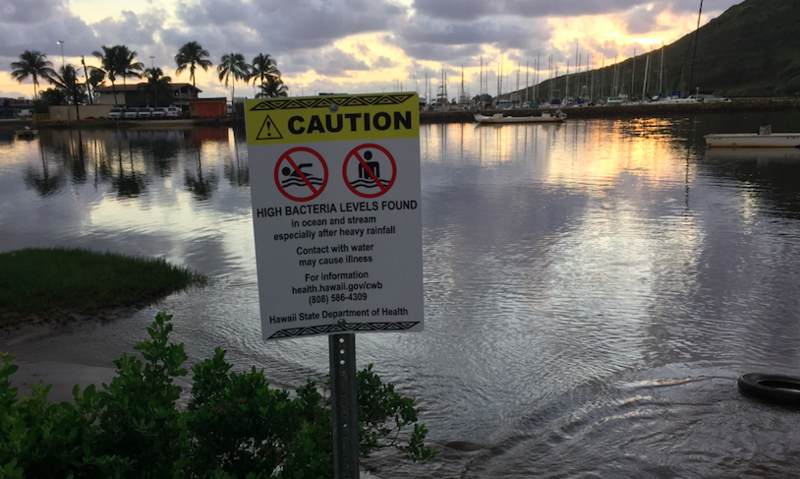 In the coming year, Surfrider Kauai looks forward to working together with HDOH to identify polluted waters and to make sure that residents and visitors alike are aware of potential health threats at the beach. 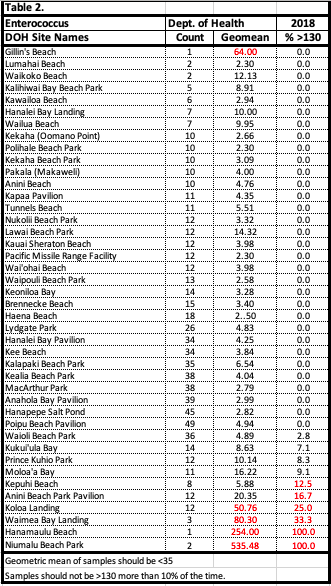 See table summaries of both Surfrider and HDOH data from Kauai in 2018 below. In order to further build community awareness of water quality issues on Kauai, the chapter gives many presentations throughout the year to different community and school groups. 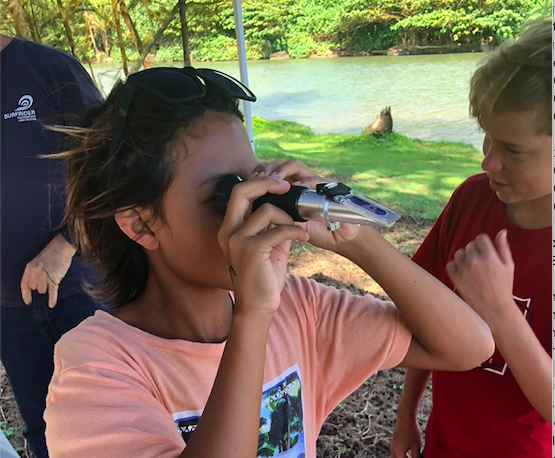 The chapter even holds hands-on workshops so local students can really engage in the water testing methodologies used by the Blue Water Task Force and develop an in-depth understanding of the local issues that affect water quality on Kauai. More media coverage of the impact these classroom and field-based workshops have on the students here. This coming year, the Kauai Chapter will be processing their water samples in lab space hosted by the Island School. 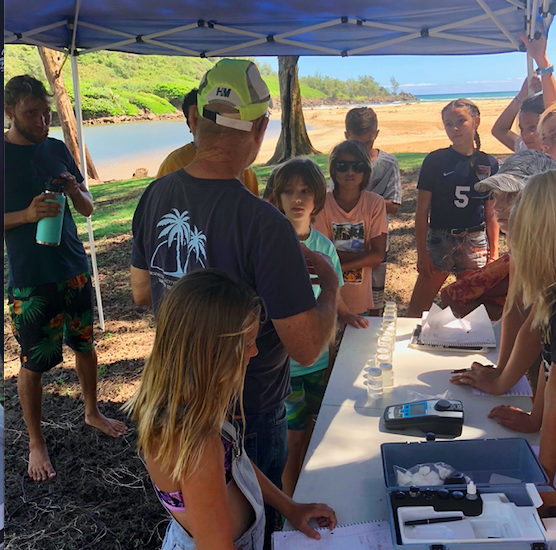 Dr. Carl Berg, who leads the Kauai Chapter’s BWTF, is working together with Dr. Jeffrey Kozak, Dean of Academics, and microbiologist Dr. John Alderete to offer training to all the student volunteers who will be participating in this program. After 10 years of maintaining their own lab space the chapter is grateful for the opportunities that this new partnership with the Island School will bring. Together they will continue to work to ensure that the health of anyone enjoying the beach or the coastal waters on Kauai is safe and protected. See where the Kauai BWTF is sampling and all their water quality data on the BWTF website. The chapter also shares all of their data on the popular Swim Guide mobile app. 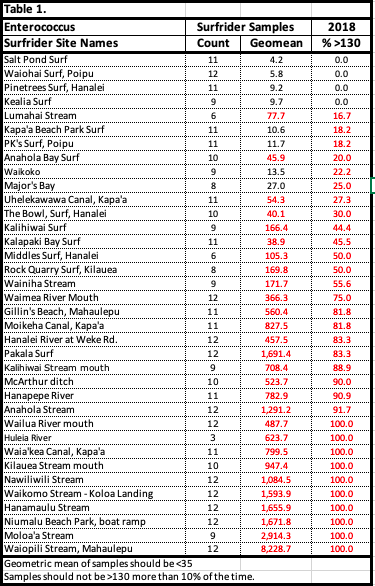 Summary tables of Surfrider and HDOH 2018 data in tables below.